Friday trading on world markets will depend greatly on forthcoming macroeconomic data. 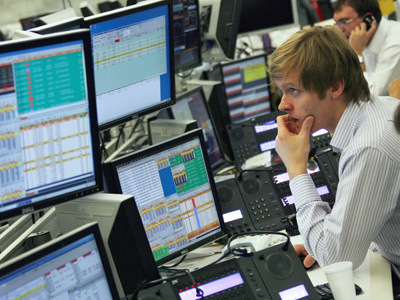 ­Russian stocks traded in negative territory on Thursday due to poor US GDP data released earlier. However, rising oil prices and generally positive dynamics in North American markets buoyed Russian indices, with both closing in the green: The MICEX gained 0.22% and the RTS climbed by 0.21%. European markets await a significant piece of macroeconomic data to be released on Friday, including the January PMI in a number of key eurozone states. Germany and France are expected to remain at 48.8 and 42.9 respectively, while the UK will likely drop slightly to 51. Overall, Europe is expected to maintain its position at 47.5. The inflation rate across the EU is also expected to arrive later in the day and stand at 2.2%. The unemployment rate is forecasted to stand at 11.9%. The ongoing season of annual corporate reports will also have an impact on trading, including a much-anticipated report from ExxonMobil expected on Friday. North American markets closed in the red on Thursday: The Dow Jones dropped by 0.36%, the NASDAQ fell by 0.01% and the S&P 500 slid by 0.26%. US markets on Friday are expected to react sharply to the forthcoming statistics, particularly labor market data. The unemployment rate is expected to arrive shortly after trading opens, and is believed to stand at 7.8%. Asian stocks traded mostly lower, with Chinese markets under pressure after manufacturing data gave conflicting signals on the health of the sector. China said Friday its official manufacturing Purchasing Managers’ Index has slipped to 50.4 from December’s 50.6, though it remained above the 50 level separating expansion from contraction. In contrast, a rival survey from HSBC, released shortly after the government’s numbers, showed a pick-up in growth, with its own PMI rising to 52.3 in January from 51.5 in December. The Nikkei 225 and the Shanghai Composite traded higher by 0.70% and 0.05% respectively, while the Hang Seng fell by 0.39%. Australia's ASX gained 0.83% during Friday trading.